UPS Inc. is helping U.S. exporters speed international shipments with a new Saturday pick-up service, the company said today. 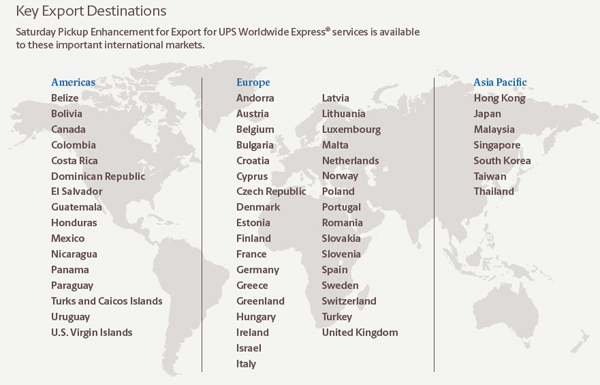 Businesses can schedule a Saturday pick-up from the United States to 57 international markets and have their shipments processed and shipped on Saturday and delivered as soon as Monday, one day faster than previous UPS time-in-transit, the company said. Destinations include countries across the Americas, Europe and Asia Pacific, with more markets to be added later this year, Atlanta-based UPS also said. The company says the new service benefits U.S. businesses that want to ship exports six days a week or that need a rush on weekend orders. It expands UPS's existing portfolio of Saturday ground delivery and pick-up services for its U.S. customers. Feedback: What did you think of this article? We'd like to hear from you. DC VELOCITY is committed to accuracy and clarity in the delivery of important and useful logistics and supply chain news and information. If you find anything in DC VELOCITY you feel is inaccurate or warrants further explanation, please ?Subject=Feedback - : UPS launches Saturday pick-up service for U.S exporters">contact Chief Editor David Maloney. All comments are eligible for publication in the letters section of DC VELOCITY magazine. Please include you name and the name of the company or organization your work for.